Colour received is in the first photo. Other photos show fit. Trousers available on our page! Adorn yourself this summer with our fairly traded tassle crop tops. By choosing our Fairtrade pieces you've ensuring the woman who made this was paid a proper wage - girls supporting girls! Handmade in Thailand using soft cotton. These have ties around the back and neck to create a flattering halter style. 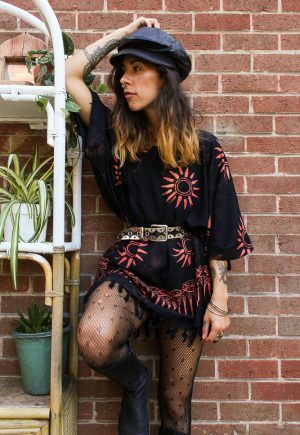 Wear at festivals, the beach, or under a shirt for casual daytime boho wear. One size fits between a UK6-12/14, back up to 34" comfortably. Sarah is 5'4 and a 30C bra size (UK8). Jewellery available separately. This hippie striped shirt is a wardrobe essential. Ideal for guys and girls, made from a lightweight breathable cotton. With a grandad collar, front pocket and sneaky side pocket. Size M UK6-12 (chest 41 / 105cm and 25.5 / 64cm long). Size L UK14-16 (chest 46 / 117cm and 29 / 71cm long) Size XL (chest 48" / 122cm and 30" / 73.5cm long) Sarah is 5’r, UK8-10 wearing the M. Opt for XL and team with fishnets, cycling shorts and docs for an on-trend grunge look or tuck into corduroy trousers for a 70s vibe!